Built in Bahamian architectural style featuring fine details, open living, and endless views from every room. 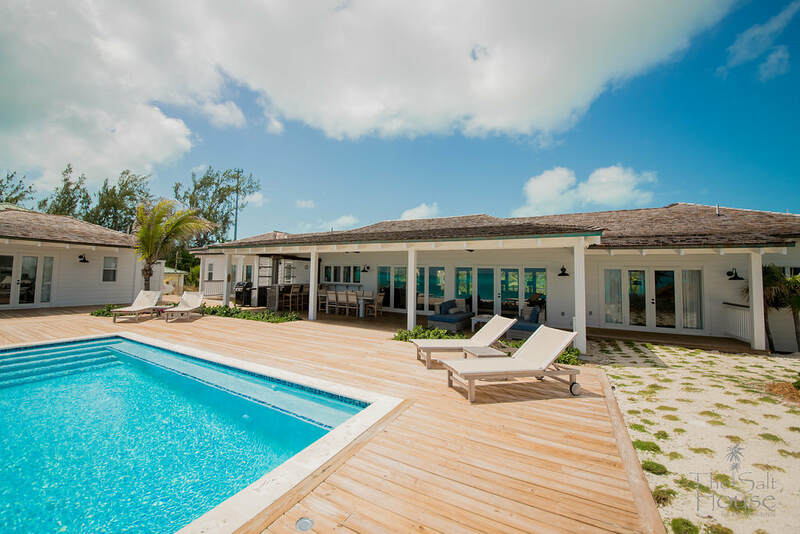 The villa features a 3-bedroom Main House (sleeps 6) and a 1-bedroom Beachfront Cottage (sleeps 2), all with ensuite bathrooms. Perched above a private cove, you'll enjoy 300 yards of white sand beach with turquoise water as far as the eye can see. The ocean's infinite shades of blue shift with the sunlight and will keep you mesmerized all day long. The layout encourages socializing with family and friends while providing spaces for seclusion and relaxation. The great room offers vaulted ceilings and french doors that open oceanside to the pool patio and gardenside to the sunset porch. Relax in the cozy seating of the great room in front of a 65" Samsung flatscreen Smart TV equipped with cable. The great room flows to the dining area and kitchen, which have been purposefully laid out for effortless cooking, while staying connected to the conversation. oceanside centers around the infinity pool with its stunning view and swaying palm trees and tropical landscaping. The poolside beach bar was inspired by the Caribbean’s rustic rum bars and built using wood salvaged from a local shipwreck. It’s the perfect setting for conversations over an ice-cold Kalik or rum punch. A private outdoor shower off the Beachfront Cottage makes for easy movement between the beach and pool. Dining alfresco on the covered deck offers endless views - the epitome of Caribbean living. A solar power system will be added to the house in December 2017, which will generate clean electricity accounting for about 40% of the home. It will also charge a backup battery system that will ensure consistent power during the occasional outage, running air-conditioners in the bedrooms, the refrigerator, electronics, and lights. Get an overview of the amenities below or checkout the details on the accommodations pages. Protecting the natural beauty of Exuma and beyond is of utmost importance to us. A solar power system to handle roughly 40% of the energy needs for The Salt House will be operational in December 2017, reducing our reliance on fossil fuels. The system also charges a battery bank that will supply power to critical appliances during a grid power outage. The infinity pool is heated by a solar pool heater which keeps the water at a comfortable temperature all year long. With over 320 days of sunshine a year, it's the perfect way to push for sustainability. The home features a reverse osmosis system providing clean and pure water for all your needs, so we encourage our guests to limit their use of bottled water.